So I’m not sure who had more fun with these monkeys, grandkids or my . Great item! Soft and cuddly these monkey's have long legs and arms to hug and tug with your pet(s). For multiple hours of fun that only multipet can bring. A random color is selected. The monkey is a nice toy, I got it for my dog. Unlike the photo only one toy is sent to you not three monkeys. Gave them to friends pets. Dogs was fighting over who got to play with it. Bought this for a hard on toys French Bulldog but it was confiscated by his friend who was staying a few days. A rather large Pit Bull mix. Neither one destroyed it and love playing with it alone and as a tug of war with no damage. Great colors and I would buy again. My dog Charly couldn't wait for me to get this package open! She knew it was hers! She LOVES her monkey! Very well made , bright colors, big. Glad I bought it. My dog Love's her new toy ! Cute and well constructed. My dog is a chewer and loves to play tug of war with it. so cute the dogs love them and the price you cant beat. I gave to my cocker spaniel who always lunges for and attacks the squeakers. The two squeakers were destroyed in less than ten minutes and he lost interest quickly. My dog just loves these babies. my fur baby love this toy Thank you for having this Item. My Boxer loves this, keeps it in his bed. These are super cute, and the dogs love them. 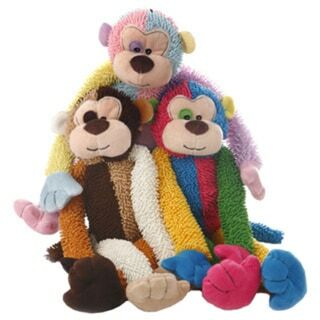 "Multipet 17-inch Multi-Crew Monkey Is this price for a pack of 3 or only 1 monkey Can we choose the colour ?" Hello Coloured Monkey, the price is for one monkey. Please let us know if you have any further questions.